Dhaka 22 Mar, Abnews: Celebration begins today across the country for the present government's historic achievement of making Bangladesh eligible for graduating from the group of Least Development Countries (LDCs). The government has taken all out preparation for a two-day celebration of the success in the capital city while the festivity will continue for a week across the country. As the main part of the celebration, Prime Minister Sheikh Hasina will be accorded a reception at the Bangabandhu International Conference Centre (BICC) this morning. At the reception, Finance Minister AMA Muhith will hand over the UN's letter of recognition to the prime minister for the significant achievement of her government in attaining the prestigious status for the nation and the country. Jubilant processions will be brought out in the afternoon from nine places of the capital city. 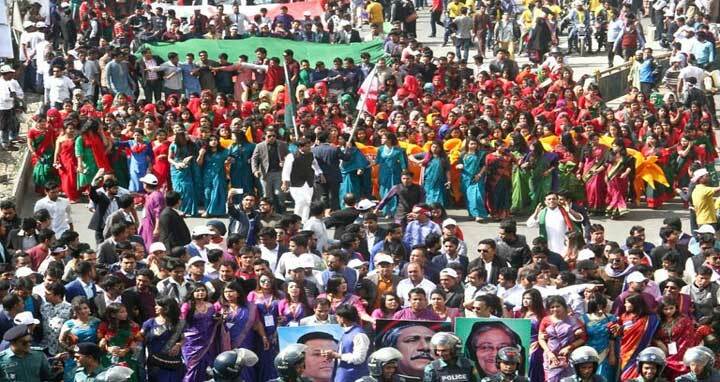 The processions will end at the Bangabandhu National Stadium in a colourful cultural show in the evening where the prime minister will attend as the chief guest. Similar rallies will also be organised across the country from March 22-28 when ministries will display the government's achievements in different sectors. The local administration will also organise photo exhibitions, art competitions, cultural shows, sport events and video shows on development activities. On the eve of the celebrations, President Abdul Hamid and Prime Minister Sheikh Hasina gave separate message, felicitating the countrymen for their contributions to attain the great honour for the country. They also hoped that the people would continue their efforts and supports to make this development sustainable. Newspapers and online news portals have published exclusive articles and special supplements, highlighting the importance of the great the achievement of the nation. Radios and television channels are also broadcasting special programmes on this occasion. The home ministry has already formed a committee to celebrate the achievement maintaining security and safety. An international seminar will be held on Friday on the prospect and challenges of the country's graduation from the LDCs. Finance Minister AMA Muhith will chair the seminar at the BICC. The Committee for Development Policy (CDP) of the United Nations on March 15 officially declared the eligibility of Bangladesh for graduating from the LDCs and handed over a formal letter in this regard to Bangladesh's Permanent Representative to the UN Masud Bin Momen on the following day. Last year in October, the United Nations Conference on Trade and Development (UNCTAD) in a report projected that Bangladesh would qualify primarily to graduate from the LDCs list in this March as the country already fulfilled all the three criteria to become eligible for the developing country status. The three criteria are Gross National Income (GNI) per capita, Human Assets Index (HAI) and Economic Vulnerability Index (EVI). According to the UN's graduation thresholds, GNI per capita of a country should be $1,230 or above. Bangladesh's GNI per capita was $1,610 at the end of 2016-17 financial year. For the HAI, a country must score 66 or above and for EVI 32 or below.